Brain booster rating: 7 out of 10 – there’s fruit in the cookies but adding a glass of milk on the side for some protein wouldn’t hurt! 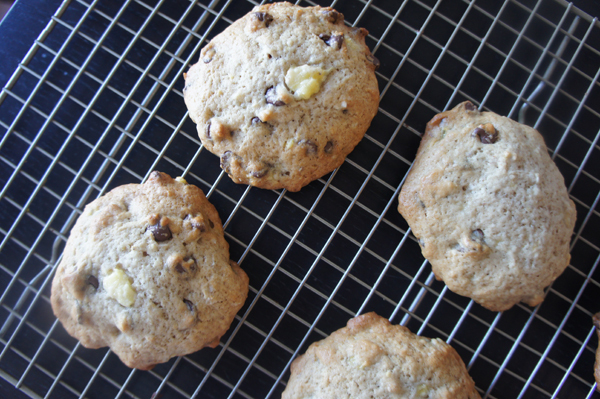 So, next time your bananas are sitting on the counter, starting to look sad, try out this cookie recipe. They taste great warm out of the oven and just like a classic chocolate chip cookie, a glass of milk on the side is always a good idea. Katie is a senior at Johns Hopkins University where she studies creative writing and spends an inordinate amount of time “procrastibaking” for her friends. Her favorite condiment is sriracha and she enjoys exploring the Baltimore restaurant scene on the weekends. Preheat your oven to 350°F. With your hand mixer, cream the butter and sugar. Add the egg and beat until light and fluffy. In a bowl, mix the mashed banana and baking soda and let sit for two minutes – during this time, the banana will react with the baking soda and will eventually give the cookies a great cake-like quality. Mix the banana mixture into the butter mixture. In a separate bowl, mix together the flour, salt and cinnamon and stir into the wet mixture in stages until just combined. Fold in the chocolate chips. 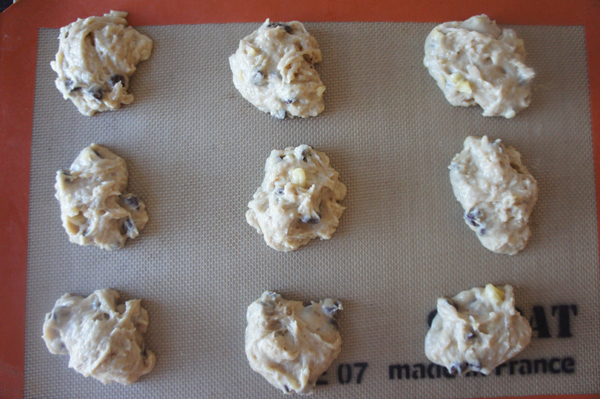 Drop in rounds on a cookie sheet and bake for 11-14 minutes or until golden brown. You had me at “cake-like”… I will be making these this week! You really should, it’ll make settling back into school post-break a little bit easier I think!